Book hotel rooms online with us at Dom Jose Beach Hotel at the lowest rate, guaranteed. 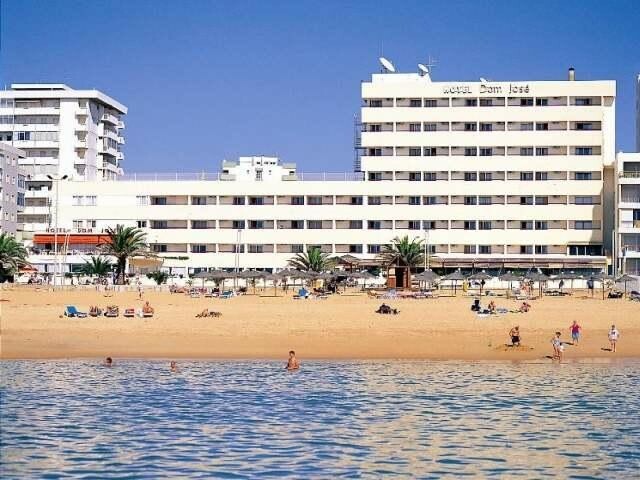 Get a holiday discount room rate at the well established 3 Star Hotel Dom Jose in Quarteira in the Algarve on the beach front with no road between the hotel and the sandy beach. The hotel was completely refurbished in 2011 and its 154 bedrooms have panoramic views over the blue ocean. The bedrooms cater only for two persons, with air-conditioning, direct dialling, satellite TV, safe, hairdryer, and either a bathroom or shower. Hotel Dom Jose in the Algarve has a comfortable lounge area and Internet access, a restaurant and a snack bar. The outdoor pool is surrounded by a wooden deck with sun loungers whilst on the 4th floor there is a 9-hole mini-golf course. An easy walk into the town will provide guests to a variety of restaurants and bars. Wi-Fi is available.